DD Hammocks is a little more well-known in Europe, but they are growing in popularity in the United States thanks to their diverse hammock camping product line and great value. The DD Tarp 3×3 Multicam (MC) is a virtual workhorse, thanks to its 19 guy points that allow the tarp to be pitched in a variety of configurations. To get the most modularity out of the tarp, it works best with hammocks shorter than 10 ft (3 m), but pitched on a diagonal, the tarp fits even long 11 ft (3.4 m) hammocks. 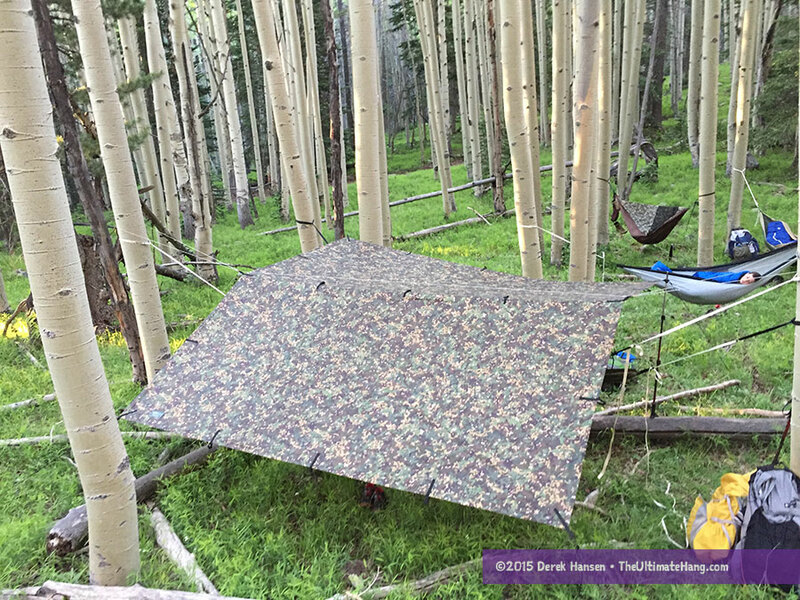 The DD Tarp 3×3 MC is a square tarp made from two pieces of 190T polyester fabric sewn together at the ridge line. All seams on the inside of the tarp are taped. The shelter features a custom-designed Multicam camouflage pattern and has a total of 19 tie-out points. The tie-outs loops are long and are made from webbing. Sixteen (16) of the tie-outs are on the perimeter. The tarp measures exactly 3 meters, squared, which is just shy of 10 feet on either side. A square tarp is one of the most versatile, especially with as many tie-out points as the DD Tarp, because there are so many options. The polyester fabric and large tie-out loops make this tarp a little heavier, but it isn’t unreasonable to take backpacking. In fact, you could hang up to three hammocks side-by-side comfortably under this tarp (in fair weather), making it work well for gear sharing. The real limiting factor for using this tarp in a rectangular configuration is that the straight edges are short for most camping hammocks. If your hammock is less than 10 ft (~3 m) long, than this tarp will be perfect. At 10 ft (~3 m) or longer, this tarp should use modified pitching options. The DD Hammock line is value priced and is appropriate for the material and construction. 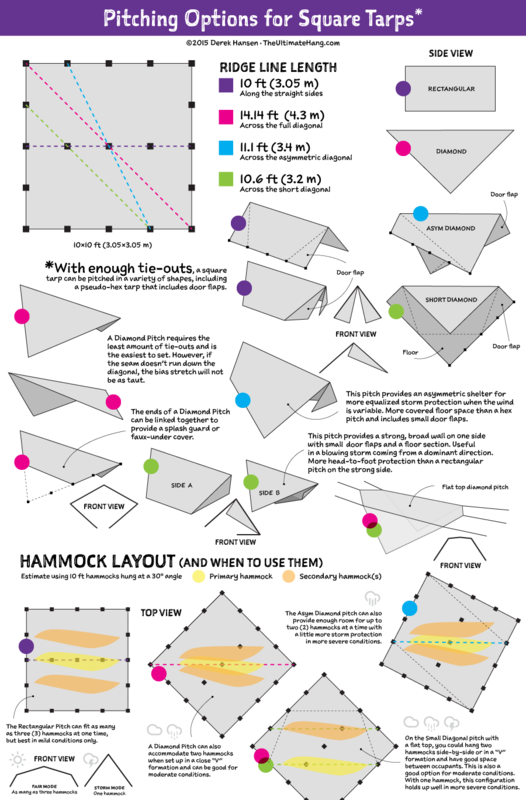 This is a great, all-around tarp that will work for most people, especially new entrants to hammock camping who are looking for a “get-it-done-without-fuss” tarp. Gram-weenies will likely stick up their nose at the weight. Camouflage outdoor gear has a lot of appeal, not only for zombie apocalypse “preppers”, hunters, or paramilitary folks—research has shown that bears tend to ignore earth toned and camouflage patterned gear, compared with brighter colored gear. 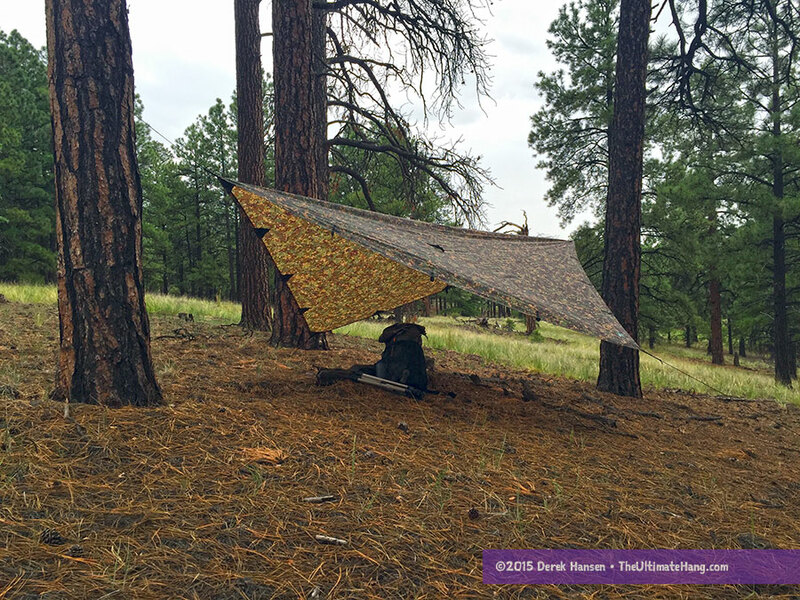 The Multicam pattern was custom designed by DD Hammock for this tarp. 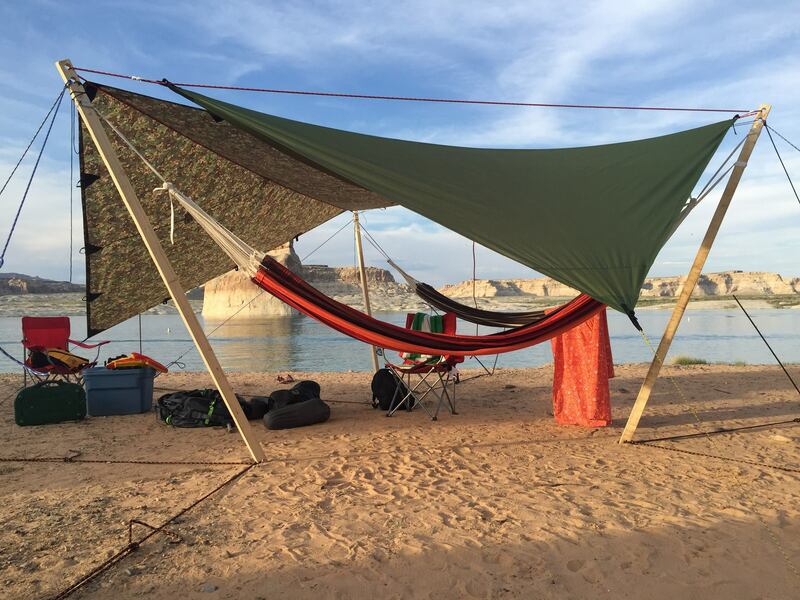 The Byer of Maine Paradiso Double Hammock on the shores of Lake Powell, Arizona. The DD Tarp 3×3 MC and the Ticket-to-the-Moon tarp are also displayed. I had a week testing the Multicam tarp on a recent trip to Lake Powell. We were expecting pretty fair conditions, with the possibility of a summer monsoon rain later in the week. It turned out a lot worse than we expected, with gusting winds every night and two thunderstorms, which ultimately drove us off the unprotected beachfront. During the day I had pitched a few tarps, but the winds ripped them off the line. The DD Tarp 3×3 MC held up without a murmur. I was impressed. The reinforced tie-outs held amazingly well and the tarp still looks good as new. I remember asking you about this, thanks so much! I have little income so dont want to regret a purchase, youve given me a lot more confidence now. I sometimes sleep on bridges etc for security when im in the next town on bike and thought storm doors on a rectangle was the limit for my limited tie-outs but having a ground sheet included is great for the woods next to me. Excellent!! Id like to see more on the beach setup you show in the picture. Specifically the rigging and hardware used to suspend he hammock with no trees. I have camped a bit this year and every site has been lacking in trees… A real bummer. I have been tossing around the idea of building a Turtledog stand buts that’s a lot of gear to pack around. Can you tell me more about it or point me to a article? Much appreciated. Isn’t “multicam” copywrited by Crye Precision? I don’t like the pattern on this tarp much, you can tell it repeats itself too much – obviously if only matters if you really want to go stealthy! Good question. Is the pattern or the name in question?